Automated tools enable your organization’s compliance management system. Nonetheless, CMS is more of a corporate compliance program than mere technology. A CMS is a series of processes, policies, and procedures that govern all your compliance efforts. As more companies implant different technologies in their operations, there’s a need to focus on cybersecurity. CMS focuses on the way your organization handles its legal requirements, as well as the ability to integrate those requirements into all processes. You must create an integrated system that can limit legal risks besides incorporating employee training and corrective action policies and strategies. The financial sector is a heavily-regulated industry. Compliance is equal to financial risk. Be it your asset-liability calculations or even the regulatory compliance standards prescribed by the federal Consumer Financial Protection Bureau (CFPB), the Office of the Comptroller of the Currency (OCC), or the Federal Deposit Insurance Company (FDIC), you can be penalized for noncompliance. It doesn’t matter whether a data breach resulted from an internal control failure or a mistake by third party vendors. Financial institutions that lack appropriate and up-to-date data monitoring tools often end up being subjected to violation notices. In late 2018, the OCC outlined four significant risks that the federal banking system faces. Of these, operational risks resulting from the complex operating environment and the resultant compliance risks were most prevalent. The FDIC recently released a statement detailing its commitment towards innovative technologies and strategies for supporting the Anti-Money Laundering/Bank Secrecy Act (AML/BSA) as well as managing the compliance risks that relate to those regulatory and legal requirements. In December 2018, the CFPB in partnership with the Credit Union Advisory Council, Community Bank Advisory Council, and the Consumer Advisory Board undertook a review of trends within the financial services industry. The organizations focused on the growing use of AI and the access of consumers to financial records. The emerging trends and technologies increase the risk of unauthorized data sharing, something that can attract fines from regulatory bodies. It is easy to presume that a CMS only focuses on ways through which your organization protects consumer data while safeguarding itself from acts such as money laundering. The reality, however, is that market transactions are increasingly getting embedded in emerging technologies. Therefore, a useful CMS is one that focuses on ways through which you can protect data in your possession. This limits the unintended consequences that typically cause customers to raise complaints about the response process. Just like the case with other compliance requirements, your CMS should include both external and internal stakeholders. These include the board of directors, senior management, compliance officers, and front-line officers. The role of your institution’s board is to establish business objectives. After that, senior management should engage in the vendor risk management process. This will ensure that all vendors are aligned with the required controls. The compliance officer’s role is basically to oversee your organization’s CMS. He/she oversees everything including researching updates and aligning the organization’s risk profiles, processes, and procedures with emerging trends. The compliance officer should also have an insight into the way your organization handles data and its third-party vendors. The compliance program that you put in place should comprise all written documents, procedures and policies, monitoring, training, and corrective actions. Typically, these procedures and policies dwell on mortgage servicing and fair lending. Nonetheless, as your organization uses SaaS platforms to engage in communications and data collection, you must figure out ways through which your technology can integrate into the process so that you are protected from privacy violations. As a financial services provider, you need to respond to any complaints that your clients may raise. Similarly, you should be able to track, monitor, and analyze these complaints. While at it, you must ensure that clients’ data is protected from unauthorized access that can compromise its confidentiality, availability, and integrity. To ensure that you stay updated on the latest market trends, you need to undertake regular compliance audits. Having a compliance program alone isn’t enough. You must regularly engage third-party auditors since this will ensure that your financial institution and its IT suppliers stay compliant with the requirements. 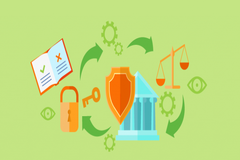 When it comes to IT infrastructure, the Electronic Funds Transfer Act and GLBA are integrated by the CFPB Supervision and Examination Manual. As your clients engage in electronic fund transfers, there’s a need to ensure that you incorporate an in-depth review of controls over any vulnerabilities to your data. You must bear in mind that your customer service reps should be your first line of defense as far as the illegal access to customers’ data is concerned. Creating safe passwords whose knowledge is only limited to authorized staff, is a step in the right direction.